Vacheron Constantin's patented world time now has a more contemporary look with the new Traditionnelle World Time featuring a gold world map. Here's a look at this watch for the well heeled traveller, with photos and pricing. The world is widely known to have 24 time zones, but it actually has a total of 37, thanks to exotic places and nationalistic governments. 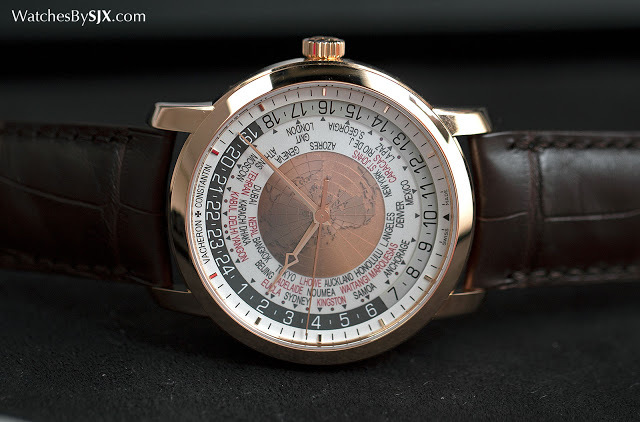 Vacheron Constantin is one of the handful of watchmakers that caters to these extra time zones, with the Traditionnelle World Time. Originally available with a coloured world map on the dial, the Traditionnelle World Time recently received a facelift with a new dial featuring a gilded map in alternately brushed and frosted gold. 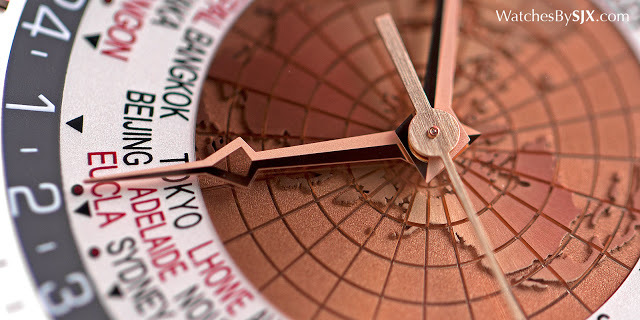 The new gold dial is made up of three parts, starting with the metal disc bearing the golden map. All the continents on the map are finished with a radial brushing, while the oceans are sandblasted. Sitting over the map is a sapphire disc, half of which is tinted a shade darker. That functions as the day and night indicator, showing which half of the world is awake. Because the Traditionelle World Time covers 37 time zones, the cities disc is decidedly more crowded than on a conventional world time watch. Cities representing time zones offset by the usual one hour are in black, while those offset by a quarter or half hour are in red. Despite being highlighted in red, such time zones are not oft visited, being places like Kabul, Yangon and Caracas, or small islands in the middle of a vast ocean. Dial aside, the rest of the watch is identical to the earlier variants of the Traditionelle World Time. The movement remains the calibre 2460 WT, a self-winding movement that’s found in many complicated Vacheron Constantin watches. Setting the world time is easy – the reference time zone is set black arrowhead at six o’clock, and all other time zones can be read from the 24-hour disc on the edge of the dial. Available in white or red gold, with a matching dial colour, the case measures 42.5 mm. 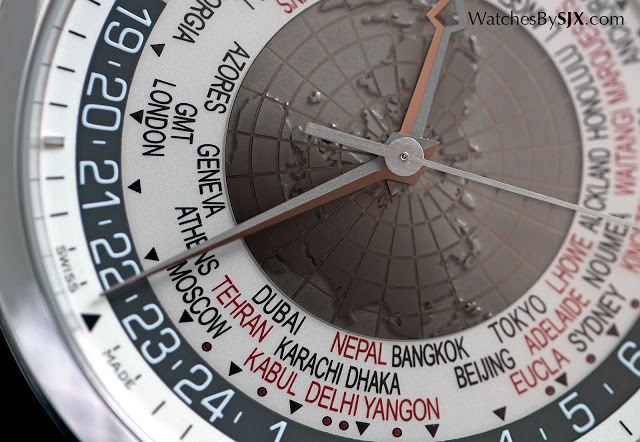 It’s large but necessary to accommodate all the time zones on the dial. 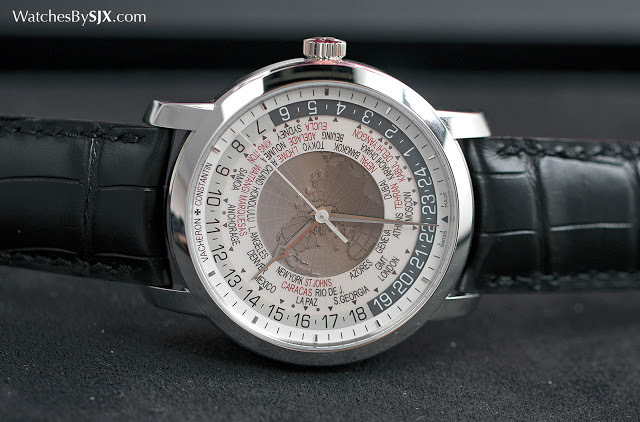 Pricing The Traditionelle World Time is priced at US$48,000 or S$74,100.